Fabric Fabric Manufacturing What Types of Fabric Faults Found in Textile Industry? What Types of Fabric Faults Found in Textile Industry? This is the defect, which spoils the external appearance, since the unevenness of yarn or the yarn knots of the warp and weft are seen on the surface. In case of high-grade fabrics, the local unevenness or knots are removed in the repairing activity. Especially, in woolen fabrics, before moving to the finishing process (after weaving), the knotting and mending of the parts with remarkable yarn unevenness and knots is done manually. Weaving steps means the yarn unevenness looks like lateral stripes. This occurs when the density of weft in some parts is coarse and in some parts it is tight. This fault is easily visible if the weft density is coarser. In colored fabrics, the parts with close density look darker and the coarse parts look lighter. Thus the fabric surface looks very bad. In addition, when it is not very clear that there are horizontal steps and when there is unevenness in the coarseness and tightness of weft density, it is termed as weaving unevenness (weft bars). During the dyeing, drying and finishing of fabrics, the warps and wefts get rubbed by calendar roller etc. and they get contorted to local irregular shapes. This are called as twists. This fault can easily in fabrics with coarse density and the fabrics using yarns with smooth surface, such as silk, artificial silk and synthetic fabrics etc. 4. Shine: This fault is seen easily in fabrics for which long fibers have been used, for example, silk fabrics, artificial fabrics and synthetic fabrics etc. There is warp pull and weft pull. The former one is seen during warp arrangement (the activity of preparing to put the warp to the loom after arranging them together), paste application and weaving when a part of the warp receives excessive tension. Due to light reflection, the warp looks as if shining brightly and the appearance is eye hearting. The warps in this case, may be 1-2 but there also may be a collection of several of them. There are short warps and there are also long warps of 1-2m. The latter one is seen during the reeling or pressing down of wefts, when the wefts are given excessive tension. The weft shines partially and the looks bad. These faults can appear easily in fabrics of flat weave or gauze, such as Haburtae silk and silk pongee. This fault is seen when the degree of warp and weft tension becomes partially uneven during warp arrangement, paste application, drum reeling and weaving etc. Due to the light reflection, the yarn appears to be glittering in spots on the surface of the fabric. This is shown easily on fabrics using long fibers. It is especially striking in plain materials. 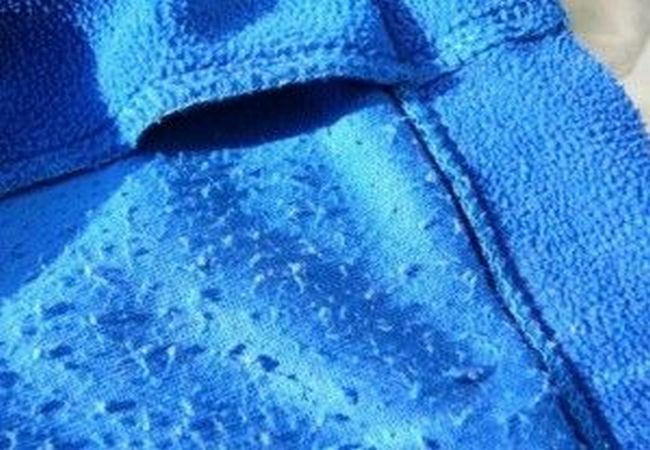 The drawback of wearing fabrics made with synthetic fibers and knit-wear undergarments is that small grain-light pills appear on the surface due to friction. This phenomenon is called as pilling. This phenomenon is commonly seen in woolen and cotton fabrics. But, since cotton and wool fibers are comparatively weak, though the pills appear, they wear out naturally and fall off. However, the synthetic fibers are comparatively stronger and so this phenomenon does not appear much. This reason is also guessed from overall result of the surface properties of the fiber apart from its strength.